A woman has died following a suspected drug-related incident at an all-night music event in Bournemouth. 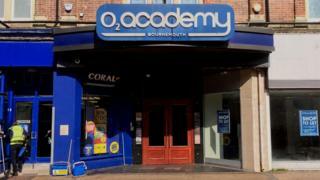 The 18-year-old went into cardiac arrest at the O2 Academy shortly before 04:30 BST on Sunday. She was taken to Royal Bournemouth Hospital but died later that morning. Police said her next of kin had been informed. The night at the 1,800-capacity venue in Christchurch Road had been hosted by Bristol dance duo My Nu Leng. Dorset Police said officers were called by the ambulance service at 04:26 after the woman, from the Thames Valley area, was taken ill.
A spokesman said: "Officers are treating the death as suspected drug-related and not suspicious. "Inquiries are being carried out on behalf of the coroner."